If you've got the perfect job or business, congratulations. But if you are even a little bit uncertain that your current gig is the right one, it is time to start thinking about your next move. In the new world of work, it's the only move that matters. What's next? is a question we all have to ask and answer more frequently in an economy where the average job tenure is only four years, roles change constantly even within that time, and smart, motivated people find themselves hitting professional plateaus. But how do you evaluate options and move forward without getting stuck? Jenny Blake's solution: it's about small steps, not big leaps—and the answer is already right under your feet. This book will teach you how to pivot from a base of your existing strengths. Pivoting is a crucial strategy for Silicon Valley tech companies and startups. Jenny Blake—a former training and career development specialist at Google who now runs her own company as a career and business consultant and speaker—shows how pivoting can also be a successful strategy for individuals looking to make changes in their work lives, whether within their role, organization or business, or setting their sights on bigger shifts. When you pivot, you double down on your existing strengths and interests to move in a new, related direction, instead of looking so far outside of yourself for answers that you skip over your hard-won expertise and experience. It empowers you to navigate changes with flexibility and strength—now and throughout your entire career. Much like the lean business principles that took Silicon Valley by storm, pivoting is the crucial skill you need to stay agile, whether or not you are actively looking for a new position. · Double down on existing strengths, interests, and experiences. Identify what is working best and where you want to end up, then start to bridge the gap between the two. · Scan for opportunities and identify new skills without falling prey to analysis paralysis or compare and despair. Explore options by leveraging the network and experience you already have. · Run small experiments to determine next steps. Do side projects to test ideas for your next move, taking the pressure off so you don't need to have the entire answer up front. · Take smart risks to launch with confidence in a new direction. Set benchmarks to decide when the time is right to go all-in on your new direction. Pivot also includes valuable insight for leaders who want to have more frequent career conversations with their teams to help talented people pivot within their roles and the broader organization. Jenny Blake is a career and business strategist and international speaker who helps people build sustainable, dynamic careers they love. She pivoted from studying political science and communications at UCLA to become the first employee at a political polling start-up in Silicon Valley. She then moved to Google, where she spent over five years in training and career development while also writing her first book, Life After College. Jenny left Google in 2011 to take her consulting business full time. A San Francisco native, she now lives in New York City. "If you should trust anyone in the career space about the way to thrive in the new world of work, it is Jenny Blake. Pivot is packed with practical, actionable and repeatable ways to remain relevant and highly employable. Jenny shares her signature killer tools and processes for the benefit of us all." "Changing jobs or careers can be daunting. Pivot is an invaluable guide for planning and succeeding in your next professional reinvention." "Wondering what your next move is? Read this book! Jenny Blake is one of the wisest and freshest voices on the subject of career development, and this is her best work yet. In Pivot, you will hear the good news: that you can get paid to do what you love. It may not look like what you thought, and it may require some personal growth, but you can find the work you were meant to do. You just have to pivot." "If you think life is a highway, then you've got it wrong. It's more like a winding path through an unpredictable forest. Not only do you have to wade the swamp and battle the beasts, but time after time you come to a crossroads. Left? Right? Straight ahead? Jenny Blake's new book will help you find the wisdom and resources to make the best choices, move into the sunlight and end up where you want to be." "The book is fantastic. No matter where you are in your career, Pivot is provokingly relevant." 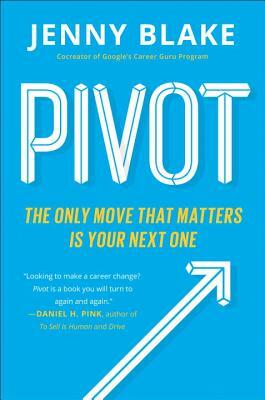 "Today, the average person has eleven jobs and three to six careers, which is why Pivot is essential reading for every professional. Let Jenny be your coach, giving you the confidence and tools required to make your next career transition. Whether you're an employee, freelancer or entrepreneur, this book will help you identify the skills you have or need that will lead to your next opportunity. Jenny has been through career transitions and has successfully navigated them on her own, which makes her the perfect spokesperson for helping you do the same. Pivot is the book that you'll need to read multiple times through your life because change is constant and often times unexpected!" "Well-researched, well-written, and well-organized, this book will appeal to those willing to invest time, energy, and effort into the process of "pivoting" their careers for the better."